Inforest Communications has completed a redesign of the UTR Global Web site (http://www.utrglobal.com/), which replaces an previous iteration of the Web site designed by Inforest in 2005. UTR provides services and software for auditing and ongoing management of telecommunications (voice, data and wireless) vendor bills. The site is built on the Drupal content management framework and includes captioned Flash video presentations which introduce the home page and UTR’s main software and services. While video presenters are sometimes featured on top of Web pages, Inforest worked to weave the speaker within the layers of the site design, giving the page a more integrated and complete appearance. 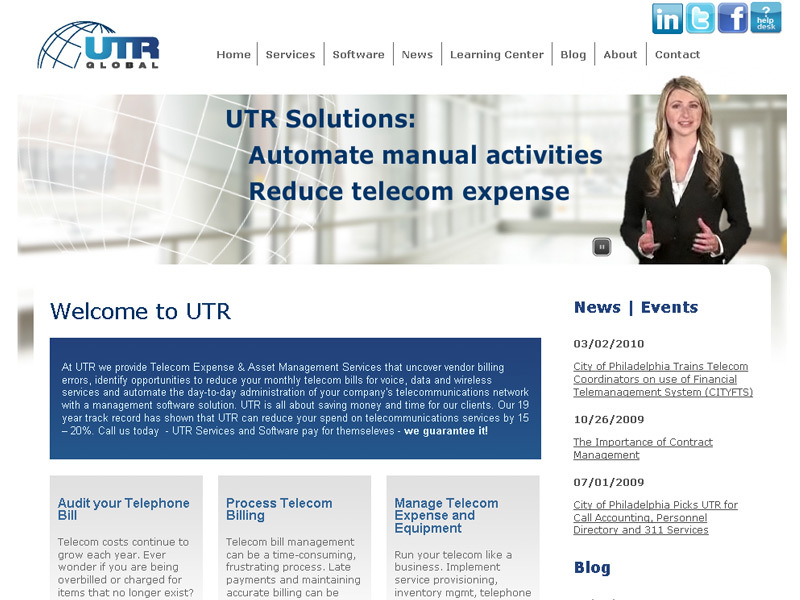 We are pleased with the site and appreciate the opportunity to continue to work with UTR in their Web marketing efforts.